1Mash black beans in a large bowl with a fork. 2Add cooked quinoa, eggs, salt, parsley, onion, shallot, parmesan cheese and oats to same bowl and mix to combine. 3Form black bean-quinoa mixture into 8 sliders, using a little water as needed to help bind them together. 4Heat a large non-stick skillet over medium heat and add avocado oil. Lightly salt and pepper sliders and add to pan. 5Cover and cook until browned, about 5-6 minutes. Flip and repeat on other side. 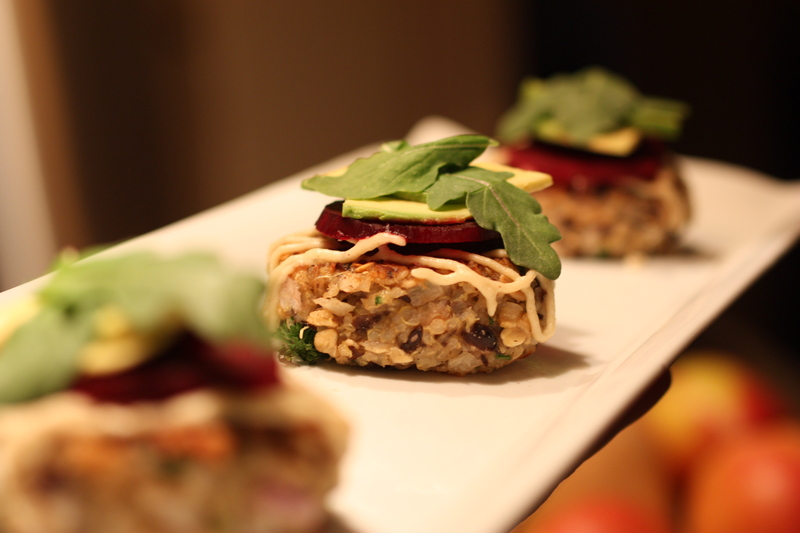 6Serve black bean-quinoa sliders drizzled with tahini sauce, topped with thinly sliced beets, avocado and arugula. 1Whisk together ¼ cup tahini with 2 tbsp lemon juice, 2 tbsp water and a large pinch sea salt. Thin with additional water for desired consistency.